Emerald Stained glass was established in 1988 where business commenced in a 25 Sq. metres workshop with one employee (I the founder of the Company). Initially very simple Lead-Light panels were made for local joinery and cabinet making businesses for the first year, and gradually extra orders were being confirmed and along with the development of some craft products a second person was employed. 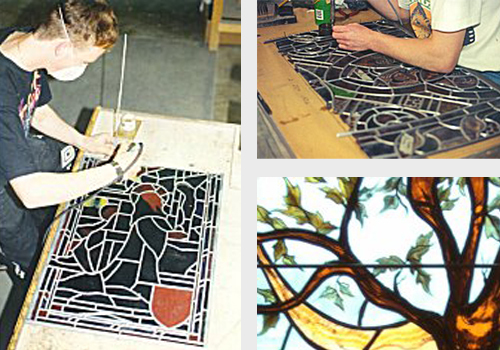 To date we have established a strong track record in the area of Restoration, Conservation and Manufacture of Stained Glass and Leaded Light windows, we have a team of 6 full time and 2 part time employees. We welcome any type and size of contract, big or small. We produce our own “Lead-Came” and manufacture a range of bronze framed venting systems for Church windows to replace where necessary existing steel framed vents that are generally problematic through corrosion. We also supply and install Security Glazing and Powder coated Stainless Steel window guard systems. At present approximately 90% of our work is Restoration, mainly with Churches but also with Listed or Preserved buildings and the remaining 10% is with the domestic market. In the last three years we have been responsible for possibly two of the largest Stained Glass restoration projects in the Country, St Patrick’s College Chapel Maynooth Co Kildare, and Daniel O’Connell Memorial Church Caherciveen Co Kerry, where the full compliment of windows were fully restored in both projects. The Company employs an experienced work force, all our employees has considerable experience in this specialised field, is fully trained in the use of specialised tools and is certified in all aspects of health and safety. My twenty plus years experience in the business along with a background in research development and design in a range of engineering fields compliment this team effort. We are therefore ready and capable to undertake the most difficult projects presented to us. Our reputation has been established through hard work; our priority is QUALITY of workmanship delivered on time, we work in accordance with all planning and conservation guidelines and the specifications set down by the Architects we work with, and we make every effort to be as flexible as is possible to accommodate all other contractors that work alongside us. As specialist contractors we do assessments, prepare reports, make recommendations and prepare costing on remedial procedures for all types of Stained or Leaded Light window for any size of project free of charge. To conclude I can say we are proud and confident that the work we have done over the years has been carried out to the highest standards possible and I hope we can rely on our past customers to verify this. I also hope we can continue to do what we do best and enjoy. A separate and more comprehensive reference list of work we have carried out both past and present includes addresses, names and phone numbers, of contractors, architects and clergy where possible. Should you wish to make contact with any of them in relation to a project we have undertaken, I’m confident you will get a positive response.